My oven just stopped working. It is always a sad day for someone that uses it quite frequently and loves to bake. Hopefully it will be replaced real soon because I am totally wanting to bake a batch of chocolate chip cookies. This is the inner fat pregnant girl talking right now. 🙂 Luckily these delicious squares were easy and also no bake. I had them ready in no time and they sure did satisfy my sweet tooth! Ummmm…. where have these been all my life? I mean. I totally ate all of the Reese’s peanut butter cups out of the stockings but now I can have a homemade pan of them? I think I am in heaven. These turned out perfect. And they were so easy to make! I love being able to make my favorite homemade treats at home. And I know that you will love them just like me! 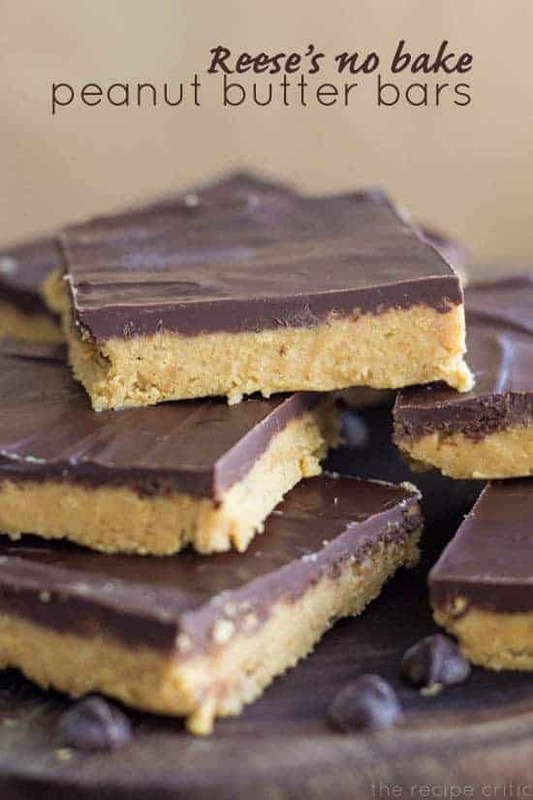 Delicious homemade Reese's Peanut Butter Cups in the form of a bar! Combine melted butter, finely ground graham cracker crumbs, confectioners' sugar and 1 cup peanut butter. Spread in a 9x13 inch pan. In the microwave or over the stove, melt 4 tablespoons peanut butter and chocolate chips until smooth. If melting In the microwave stir after every 30 seconds to make sure that it doesn't burn. Spread on top of the peanut butter layer. Refrigerate for at least an hour before serving so that they can set. Store leftover bars in the fridge. Whaaatttt! I hope you get that oven back! However, because it broke, we now get to eat these ah-may-zing little squares! If it has pb and chocolate, I am in? And ESPECIALLY when it’s not bake and only 3 steps. Pinned! Made these last night, super quick and yummy! Oh my! I hope you get your oven fixed soon. I think I might have a heart attack if my over stops working. This version of the peanut butter cups sounds so good I could eat the entire pan! This is one of my favorite recipes for no-bake bars! Just heavenly! I made these tonight (just a half recipe because I’m low on butter) and half the pan is gone already. They may not last until morning. Thanks (I think)! Was wondering can you use margerine if you don’t have butter. Yes I am sure that it would! Let me know how it turns out! I used all natural PB and they came out Great! These are wonderful. Unfortunately, I’m having trouble cutting them up so they look nice to serve at a party or something. Any suggestions on getting a nice clean cut? You say store leftovers….what leftovers? In my house they were gone in three hours! YUMMY! (there are three of us). Maybe a very silly question. But in step you say : melt 4 tablespoons peanut butter and chocolate chips until smooth. Does this mean, combine the 2?? And then spread it on the pb layer?? Anyways thanks for the recipe, I am in LOVE with Reese’s cups but can’t buy them where I live. NOW I can make them myself..so thanks!!!! The recipe calls for 2C of confectioner sugar. This may sound like a stupid question, but does that mean the whole box, which is 16oz. or do you measure out 2 cups. Measure. The box is most likely sold by weight, not volume. I made these to bring to work yesterday. But tweaked them a little. I used 2 cups of peanut butter. read reviews from another similar recipe and I mixed melted butter and peanut butter tiger. Then mixed graham crackers and sugar together. Then mixed two batches together. Put in a pan lined with parchment paper for easy cleanup and it lifts right out for cutting into squares. Refrigerate 1st for 20 minutes before adding chocolate and peanut butter layer. I used 2 cups of semi sweet chips and 4 TBL peanut butter and added 1 TBL crisco and put in microwave for 1 minute, stirred and then 15 seconds stirring for a very creamy mixture. (Crisco makes a difference), Refrigerate for an hour before cutting. They were huge hit…thank you!! This recipe is so simple and utterly delicious. It never lasts very long at my house even though there are only two of us. I always try to get my boyfriend to take some to work but he refuses because he doesn’t want to share them. Thank you for the recipe! I used natural peanut butter and it didn’t turn out right. I stirred it completely, so that wasn’t it, but I think it’s just too soft a peanut butter for this. These sound delicious! I love that you used crushed graham cracker in them, I never would have thought of that! By the way, what is Graham Crcker Crumbs? Is it any crushed salted biscuits?????????? Anyway thks 4 z recipe. Gramcrackers are like ginger or tea biscuits in the UK. All you have to do is look up graham crackers in the USA and it will show you what they look like and maybe then you could figure out what they are where you live. I tried making these and I had a really hard time cutting through the chocolate without breaking or cracking. Can you tell me the best way to cut these into squares? Try running your knife under hot water before every few cuts. Warms the chocolate up a little so it gives way a little easier. Since 4T=1/4 C, it might be handy to use that measurement in the recipe! For some unknown reason I was unable to rate this recipe, but it definitely was more than 5 stars! Made a gluten free version of this for a friend who is allergic to gluten and brought it to a bigger gathering – got glowing reviews from everyone. I CAN’T WAIT TO MAKE THE PEANUT BUTTER BARS! I have a question about the no bake peanut butter bars. It calls for 2 cups of confectioner’s sugar. I was wondering have you ever worked with stevia as a replacement for sugar in anything like these bars? I’m diabetic and would like to reduce the carbohydrates. And if you have used Stevia before can you tell me how much I should use to replace this sugar? These sound too good to be true.